It’s time to ‪#‎MeetWilden‬! 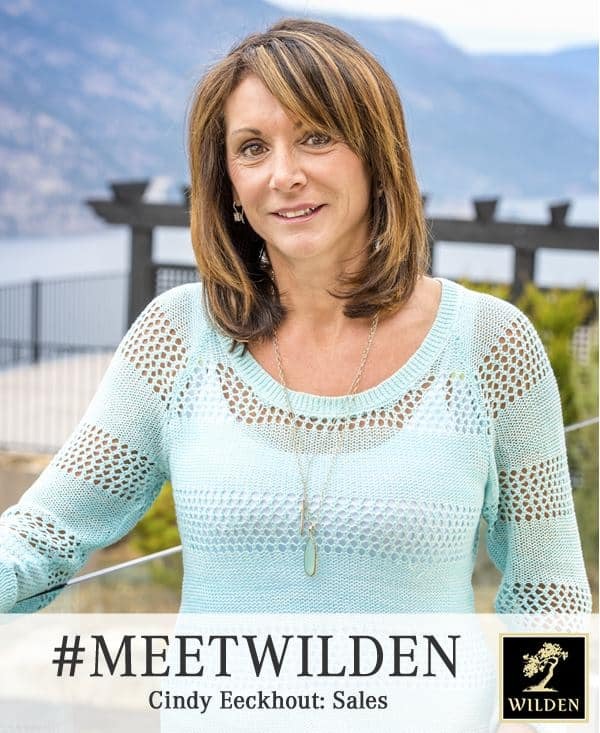 Meet Wilden Sales Team Member, Cindy Eeckhout! It doesn’t seem that long ago, but about 13 years ago I had the opportunity to become involved in the sales of the first lots available in Wilden. Well, it hardly seems like work. I live 2 minutes from the office, I get to talk about something I love and the people are awesome! Hmmm, I’m really good at keeping my secret power a secret. Love being on the water with family and friends or going to the local wineries. The views from most lots in Wilden are spectacular and now I’m spoiled and can’t imagine doing without it. Also, I know this sounds pretty minor but I walk the trails up at Wilden regularly with my dogs, Sophie and Bo, and the dog wash we have in the garage is the BEST! I have always been passionate about horses and love riding, specifically Dressage, and ride regularly. It’s way more fun than going to the gym. I love September in Kelowna. The town quiets down with tourists having headed home and the kids back at school. The weather is usually sunny with just a bit cooler temperatures. The Okanagan has some of the best wines around. Also being able to buy fresh fruit in season right of the tree is awesome. I’m a Vancouver girl, born and raised and I love that city so I would absolutely head back to my roots.